On the heels of Pollo Tropical’s new grilled Chicken Quesadilla Wrap comes the chain’s new Chicken Quesadilla Salad, now available in all company-owned restaurants for a limited time. The Chicken Quesadilla Salad features Pollo Tropical’s marinated grilled chicken breast, romaine lettuce, black bean fiesta mix, multicolored tortilla chips, shredded chesses, and a chipotle ranch dressing topped off with a cheese-filled tortilla. The Chicken Quesadilla Salad is available now for $6.99. 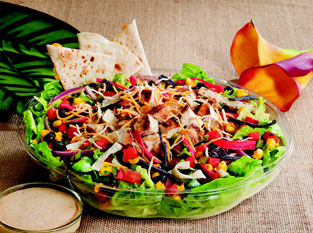 According to Pollo Tropical senior director of marketing Kim Miller, the new Chicken Quesadilla Salad compliments Pollo Tropical’s line of fresh salads, which include Chicken Cesar Salad and the Caribbean Cobb Salad.